Prof. Kashyap’s new book, ‘Veda knowledge in the Modern Context’ is a godsend. In six parts, consisting of 41 Chapters, Prof. Kashyap has explained in simple terms about Veda and its relevance today in this new book. As the person who has meticulously studied Veda in all its esoteric, spiritual and psychological meanings as propounded by the great intellectual and modern Yogi, Sri Aurobindo, and ably elaborated further by Sri Aurobindo’s disciple and Veda practitioner, T.V. Kapali Sastry, Prof. Kashyap has translated the mantras of all the 5 Vedas in 26 volumes and has written over another 50 short booklets on Veda during the past 15 years. This book, ‘Veda knowledge in the Modern Context’ appears to me as his attempt to summarize the essence of all those book into a single easy-to-read book that will answer most of the frequently asked questions with a view to develop interest in the reader to want to learn, understand and study Veda further and in depth. And I say that he has succeeded in such an attempt because, I believe, that the reader’s curiosity and interests in Veda will be sparked by this book motivating the reader to pursue further the detailed study of Veda. Dr. R. L. Kashyap is Professor Emeritus of Electrical and Computer Engineering at Purdue University, Lafayette, Indiana in USA. He is the recipient of many International awards. In 2003 he has received ‘Vedanga Vidvan’ award instituted by Maharshi Sandipani Vadavidya Pratishthan (Ujjain), an autonomous body of HRD, Govt. of India. He is the receipient of Karnataka Rajyotsava Award – 2012. He is honoured with ‘Veda Brahma’ award by Bharatiya Vidya Bhavan in 2013. Prof. R. L. Kashyap has received ‘Sir M. Vishveshwaraya Award’ by Swadeshi Science Movement’ in 2013. Veda, the sacred text of Hindu faith, is treated with respect and admiration by Hindus. Yet, few of them have studied it or understood what it contains or what its relevance was in its time or is its relevance for the present. Deeply mired in confusion with the various English translations of Veda by Westerners and by other Indologists of the past two centuries, lacking in knowledge of Sanskrit and thus unable to read and understand original Veda mantras, most persons of Hindu faith know little or nothing about Veda. To all of them, Prof. Kashyap's new book, "Veda Knowledge in the Modern Context" is a godsend. In six parts, consisting of 41 Chapters, Prof. Kashyap has explained in simple terms about Veda and its relevance today in this new book. As the person who has meticulously studied Veda in all its esoteric, spiritual and psychological meanings as propounded by the great intellectual and modern Yogi, Sri Aurobindo, and ably elaborated further by Sri Aurobindo's disciple and Veda practitioner, T.V. Kapali Sastry, Prof. Kashyap has translated the mantras of all the 5 Vedas in 26 volumes and has written over another 50 short booklets on Veda during the past 15 years. This book, "Veda Knowledge in the Modern Context" appears to me as his attempt to summarize the essence of all those books into a single easy- to-read book that will answer most of the frequently asked questions with a view to develop interest in the reader to want to learn, understand and study Veda further and in depth. And I say that he has succeeded in such an attempt because, I believe, that the reader's curiosity and interests in Veda will be sparked by this book motivating the reader to pursue further the detailed study of Veda. The six parts of the book are organized in a self-contained manner so that the beginner or the reader with some knowledge of Veda can begin reading any part of the book of interests to him, complete it and then move on to another part of the book. Or, one can read the book from beginning to end. All the frequently asked questions on Veda are posed and answered in simple terms. The definitions of terms like Mantra, That One (tat ekam), Devas (or Gods), Dasyus (or Demons) are explained clearly and lucidly. 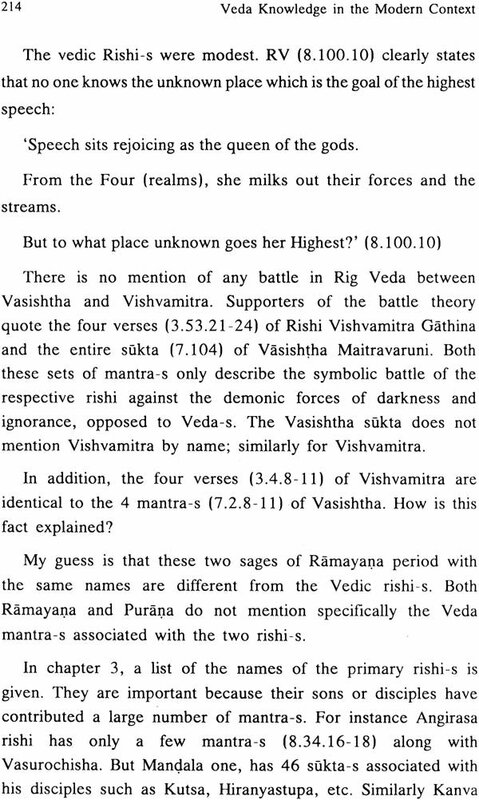 The discussions in Chapters 5 and 6 of Part I on principles for 'word meaning assignments' and the 'meaning of words' in Rig Veda are useful information, not seen in other books on Veda and very valuable even to many Veda experts. 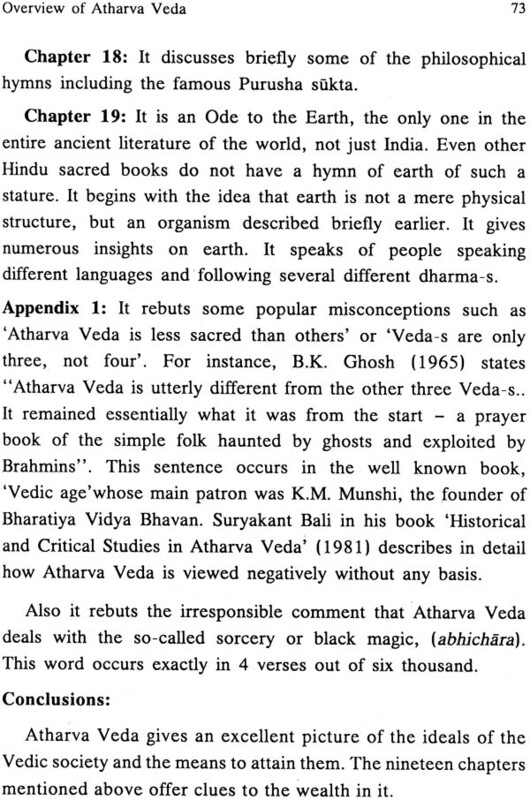 The 'erroneous references' frequently made, by ill-informed persons, and/or detractors, of Veda, that Atharva Veda and Tantra are nothing but 'black magic' causing harm to others is refuted clearly. 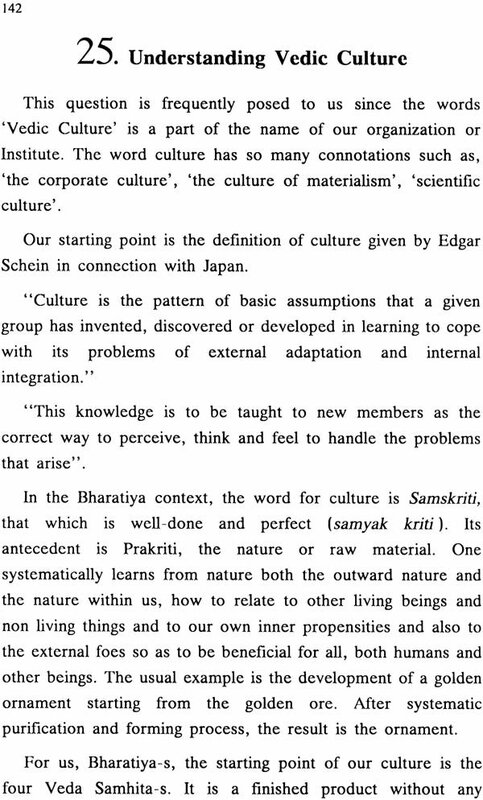 Not only that, Prof Kashyap succinctly discusses the very many excellent mantras of Atharva Veda - dealing about Vedic education systems, about the sukta on earth that earth is not a 'lump of dirt' but a living organism (ideas first discussed in the West only recently in the 1970s) and the mantras of 'subhashitams' (cryptic statements with powerful ideas and advice). The discussion and explanations of Tantra in Chapter 14 make it very clear that there is almost a one-to-one correspondence between the Gods in the Tantra and the Gods in the Vedas. The chapters on dating of the Vedas, the Harappa Civilization, details of Vedic Culture and the continuity of Hindu Civilization from Vedic times to the present day discussed in Part IV are worth reading by beginners to Veda and Veda- knowledgeable people for the thoughtful and reasoned presentations therein. The chapters in part V discussing tasks ahead to be accomplished gives suggestions and ideas for well- wishers of Veda, especially to those who are committed to the preservation, research and dissemination of Veda at the present times and for posterity. The large number of Appendices (10) in Part VI contain useful and valuable information. 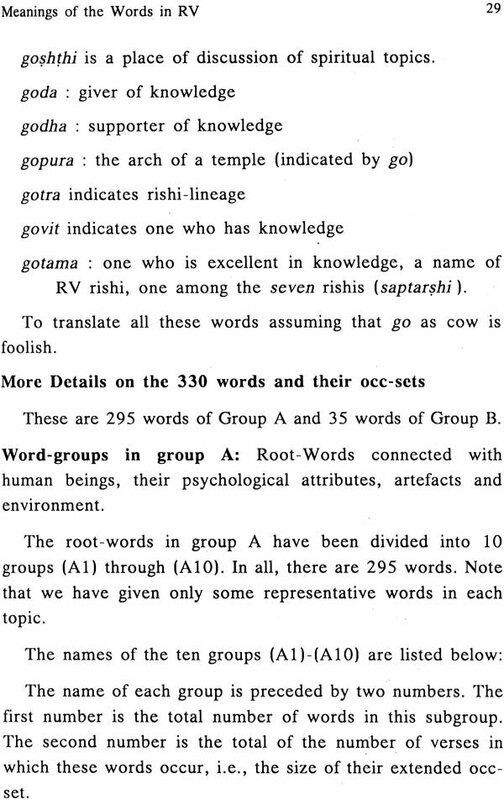 Special mention, however, must be made about 4 of these Appendices - chapter 33 (on the Western and Indologists' translations versus SAKSHI translations of Veda), chapter 37 (on the killing of bulls) and chapter 38 (on the unified view of the Vrtra and Vala episodes), chapter 40 (on the rishi-s] - for the nice rendering of these difficult topics. All readers - beginners and experienced Veda lovers alike - and almost all persons belonging to Hindu faith would benefit, In my opinion, by the careful reading of this book. Prof. Kashyap is to be commended for devoting his time and his expertise to bring out this book on 'Veda Knowledge' and its relevance to our present times. 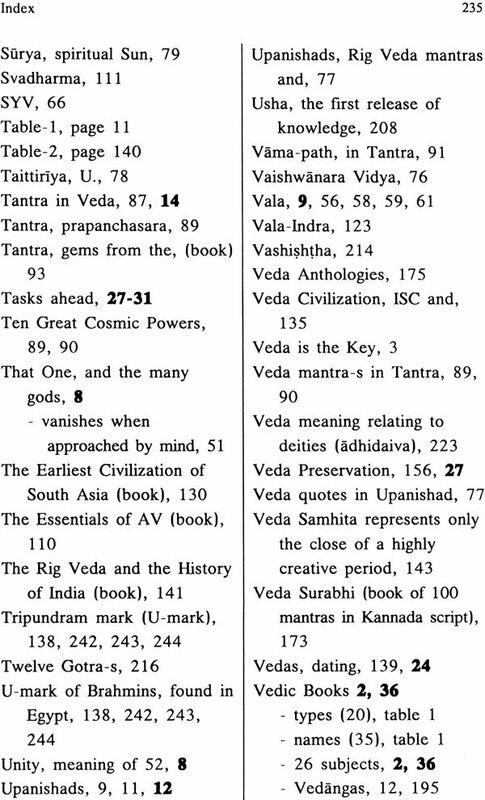 What are the various books in the collection called Veda-s in the broad sense of the word? Does this collection have a core? What is the connection between this core and other ancient books of knowledge such as Upanishads? What is the connection between this core and the ancient texts of Yoga and Tantra? What is the relevance of these texts to modern spiritual seekers? Does this core of the Veda-s indicate new paths of spiritual knowledge? What does this core of the Veda-s say on the ontological questions of the One and Many, Man and Gods, this world and other worlds? Are there other modes of knowledge besides intellectual knowledge, which is the type of knowledge made familiar to most of us because of advances made by modern science and technology? The above questions are of interest to serious students of Indian culture whether they are Hindus or not. The primary reason why one should read the core of the Veda-s, the so- called Rig Veda Samhita, is that it provides answers to most of the above questions. However, a casual reader of the Rig Veda Samhita finds only hymns to various Deva-s or Gods and the answers to the various questions raised above are not clear. 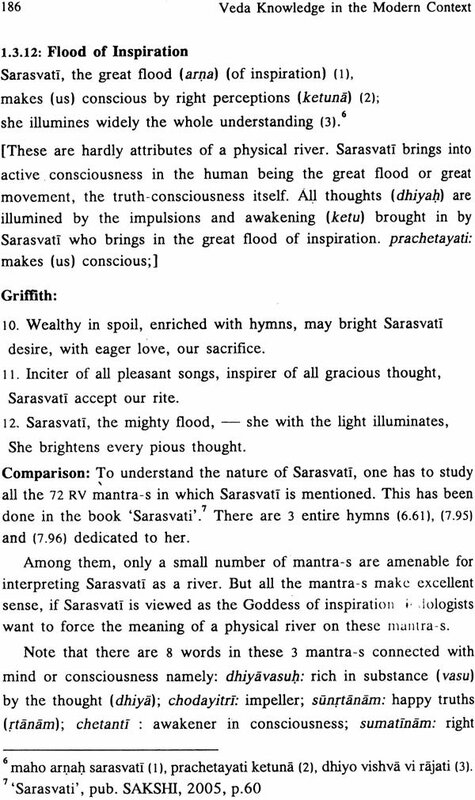 The meaning of the hymns of Rig Veda will be transparent only if we remember, while studying the texts, the comments provided by Sri Aurobindo and Sri Kapali Sastry. Both Sri Aurobindo and Sri Kapali Sastry suggest that Veda- s have at least two interpretations, the surface or the external interpretation and the internal or esoteric or symbolic interpretation. The external interpretation has been the basis for most of the standard Sanskrit commentaries like that of the great medieval scholar Sri Sayanacharya or the English translations and commentaries authored by western indologists and their Indian followers. 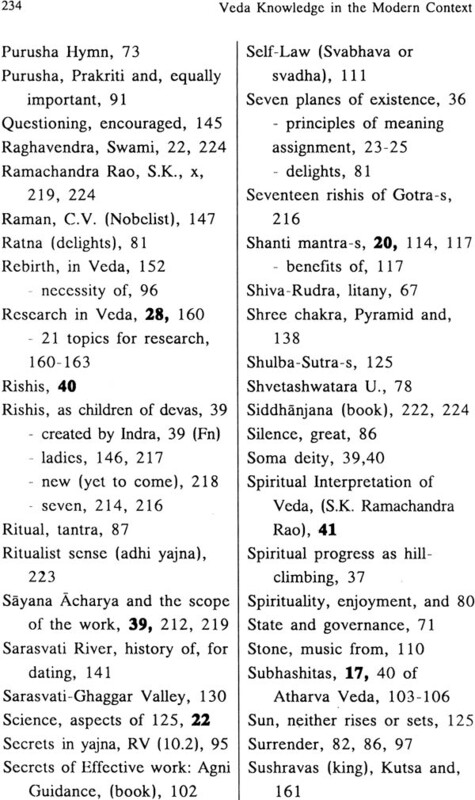 The importance of the work by Sayanacharya (1315-1387 CE) is in the chapter 39 of Part VI. 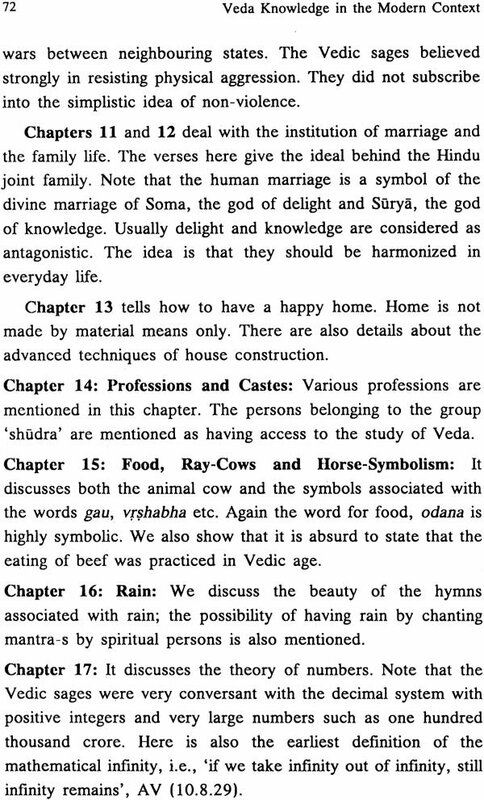 Obviously one cannot get the internal meaning of the Veda-s from these texts. The translations and commentaries on the Veda-s by Sri Aurobindo and Sri Kapali Sastry and their disciples like Sri M.P. Pandit give us a map to understand the esoteric meaning. Based on these sources, Kashyap has translated into English all the mantras in all the four Veda-s, (Rig Veda, Yajur Veda, Sama Veda and Atharva Veda) in 26 volumes 5, the books giving both the Sanskrit text of the verses and their translation. Only by understanding the esoteric sense of the Veda-s we can get the ability to find in them the answers to the various questions posed earlier, and the relevance of the vedic knowledge for moderns. Overview: This book has 41 chapters distributed into six Parts. 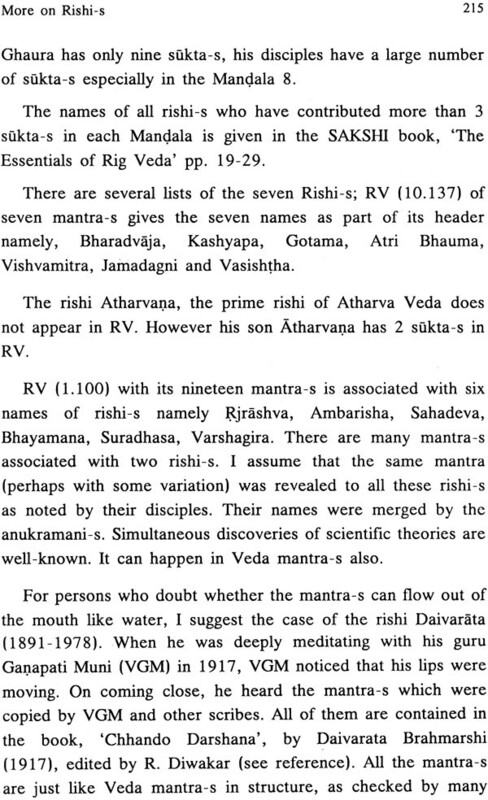 The Part I with its eight chapters tries to establish that all the basic spiritual knowledge associated with the sanatana dharma is in the four basic books in Vedic Sanskrit having the names Rig Veda, Yajur Veda, Sama Veda and Atharva Veda. Each verse or mantra of these books has simultaneously a surface meaning, and a deep meaning which indicates the hidden spiritual knowledge. A brief overview of the spiritual interpretation of Veda is in the chapter 41 of Part VI. This hidden knowledge can be restored by recovering the hidden meaning of the key-words in the Rig Veda. 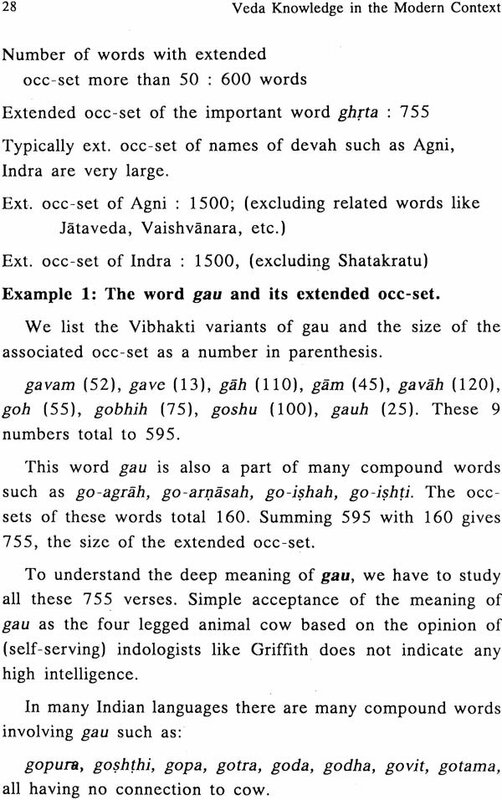 Most of the occurrences of the words in the Rig Veda can be traced to these 600 key words as indicated in Chapter 6. Thus to understand the Veda, the Veda itself is the key. It is a big mistake to try to understand the Veda using the books such as Purana-s which are of a much later origin. Chapter 4 gives replies to the question, 'Why should Veda mantra-s have multiple meanings? Sentences having many meanings are rare'. The chapter 33 of Part VI compares our translations with those of the indologists such as R.T.H. Griffith and thus highlights the superiority of our work. Part II with its 6 chapters focuses on the other Vedic books such as Yajur Veda, Atharva Veda and Upanishads and the associated practices known by the names of Yoga, Tantra and Yajna. There are many misconceptions about both the Yajur Veda and Atharva Veda. Yajur Veda is not a mere book of rituals. It deals with many philosophical issues and also Mathematics. The label of black magic has been hoisted on Atharva Veda. It is the earliest book on ecology and also on the healing arts. Upanishads are not, 'a revolt against the ritualism of Veda-s'. They elaborate on the topic, 'Supreme Being', which is termed as, The One (tat) or That One (tat ekam), in the Rig Veda in several sukta-s.
Part III with its 5 chapters is entitled, 'Relevance of Veda-s Today'. We encourage all persons to study the Veda-s, not because they are our oldest scripture, but because their message with all the details is valid for all times, not merely the 21st century.